Mizoram’s 686,305 voters, almost 51% of them women, will on Monday choose between a flagship programme of the ruling Congress and the Opposition’s call for a return to ‘Mizo nationalism’. Mizoram’s voting percentage has been on the higher side — 76.32% in 1998, 78.65% in 2003 and 80.02% in 2008. It is expected to be no different this time despite low-key campaigning owing to restrictions by a church-controlled NGO. The Congress hopes to ride the ‘success’ of its pro-poor New Land Use Policy (NLUP) by giving `1.25 lakh to 135,000 of its 257,581 households in a state where 50% of the population have been the programme’s beneficiaries. “The people voted us to power last time so that we could implement NLUP. They want us to continue the good work,” chief minister Lal Thanhawla said. Two factors have kindled Congress hopes. One is the tendency of Mizoram’s voters to give a party a second chance. The other is the three-party Mizoram Democratic Alliance for “betraying a certain lack of confidence”. Alliances have not worked in the hill state. But the Mizo National Front (MNF), the dominant party in the MDA, admitted to tying up with two other regional parties after assessing its strengths and weaknesses seat by seat. It hopes to cash in on resentment among the rural poor who missed out on NLUP “for not being Congress supporters”. The MNF is also banking on its credo of a ‘return to Mizo nationalism’ — a concept of self-rule steeped in Christian values — to translate into votes. This concept has also made the party repeatedly target the Congress for trying to impose ‘Indian nationalism’ on the Mizos. Zoramthanga, a 69-year-old rebel-turned-politician, is fighting a tough battle. He not only has to win his own East Tuipui seat, but also has to ensure that his party, Mizo National Front (MNF), succeeds in defeating the chief minister Lal Thanhawla-led Congress. The MNF has cobbled up a viable pre-poll alliance - the Mizoram Democratic Alliance (MDA) - with two other opposition parties, Mizoram People's Conference (MPC) and Maraland Democratic Front (MDF). The MNF headquarters in Aizawl was buzzing with activity on Friday. The party leaders said Zoramthanga has meticulously planned the pre-poll alliance to prevent division of opposition votes. "In the last election, Congress won because the opposition was a divided house, but this time we are united, said Thanga, a local MNF leader. In 2008, MNF was defeated by Congress with Zoramthanga losing from both the Champhai North and Champhai South seats. The party could manage to win only three seats, while Congress saw a landslide victory with 32 of the total 40 seats. "This time, I am sure to win, though the winning margin may not be very big. Overall, MNF will do better and form the next government. I have high hopes from the voters of Mizoram," Zoramthanga told TOI. "This alliance had swept the assembly polls in 1998, and the truck is better this time," he added. Born in 1944 at Samthang village in Champhai district, Zoramthanga, after graduating, joined the insurgency movement led by the legendary Laldenga in 1966 to fight the Indian forces. In 1966, insurgency engulfed Mizoram after the great famine of the late fifties brought starvation to Mizo homes due to mautam (bamboo flowering). The failure of then Assam government to rush in supplies to the people of Lushai Hills district had made the Mizos angry and they decided to support Laldenga's call for separation from India. Zoramthanga then went to East Pakistan (now Bangladesh) in 1969 for arms training. By 1979, he had become a close aide of Laldenga and was made the vice-president. After Laldenga signed the Mizo Peace Accord in 1986, leading to the creation of the state of Mizoram in 1987, MNF became a political party. MNF formed the government in 1987 under Laldenga's leadership, and Zoramthanga was made the number two man in the cabinet. When Laldenga died of cancer in 1990, MNF chose Zoramthanga as his successor, who led MNF to victory in the 1998 and 2003 assembly polls and became the chief minister. But, he could not stop the anti-incumbency wave in 2008 and lost to Congress. Despite Congress riding high with its populist New Land Use Policy (NLUP) programme, the MNF president vowed to fight back. Terming NLUP a total failure, Zoramthanga said, "NLUP is just a money distributing system and not a scheme for economic development. The voters know this well. Government employees were antagonized as the Congress government was diverting the plan funds to the NLUP." However, he did not think twice before promising the electorates another populist scheme that too may not do any good for the state's economy. He defended his brainchild - Socio Economic Development Programme (SEDP) - and argued that once launched, it would revolutionize the economy of Mizoram and other northeastern states. A veteran regional leader, Zoramthanga also closely monitors national politics. With regional parties likely to call shots in the 2014 Lok Sabha election, he is weighing MNF's options at the Centre. "The Lok Sabha election is still some months away; we will take a stand when it comes closer. As of today, we are not joining any side," he said, making it clear that MNF cannot join hands with Congress. 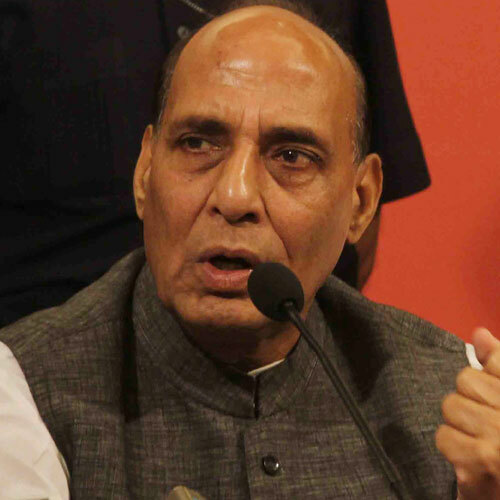 Bharatiya Janata Party (BJP) president Rajnath Singh on Saturday expressed confidence that his party would perform better here in the upcoming elections. “I feel in Mizoram, our performance would be better, and we might win a number of seats here,” he said. He further said that ruling Congress Government has to pay special attention to the development of the North East states, and added that people in Mizoram are very disappointed with the extent of development undertaken by the Congress. “I feel due the presence of Congress government here for such a long time, there has been less development here. People here are very disappointed, and I feel the government should pay special attention to the development of the north east states,” he added. Mizoram is going to polls on November 25, and results would be announced on December 8, along with those in Chhattisgarh, Rajasthan, Madhya Pradesh and New Delhi. Guns and militants have become possibly a last-minute issue in Monday's polls in Mizoram, for long the Northeast's most peaceful state. The last few days have seen the state gripped by allegations and counter-allegations of parties working with militants to get votes in the northern areas bordering Manipur, home to large populations of the Hmar and Paite tribes, some of whose leaders have for years demanded tribal districts. The row began on Wednesday when Hmar leader B Zahunga, appointed by the Congress as a member of the Sinlung Hills Development Council in a region inhabited largely by Hmars, was shot in the ankle by militants while he was walking home. The Congress immediately blamed the Zoram Nationalist Party, said to be the dark horse in the polls owing to the popularity of its president, Lalduhoma. The Congress has charged it with working with militants. The ZNP, possibly facing its most hopeful election yet as it has never formed a government, has gone into damage control, holding press conferences to deny the allegations and condemning an assault by "Congress workers" on a campaigner for a ZNP candidate. ZNP leaders also distributed copies of agreements between leaders of the Congress and the Mizo National Front (the MDA's main constituent) just ahead of past assembly elections. The Hmar Welfare Committee, whose members are peace talks delegates of the militant group Hmar People's Convention Democratic, too issued a public statement saying Hmar political leaders had in the past been betrayed by the Congress and the MNF. What has made these allegations and counter-allegations a major last-minute poll issue is that a consortium of the state's largest mass-based voluntary organisations has issued a joint statement asking people "not to vote for parties that rely on the strength of militants to win votes". Congress: 32 MLAs in outgoing 40-member house. It has been declaring: "Congress is winning, and it appeals to all to recognise how miserable it is to be represented by an opposition MLA, and so vote for the Congress." 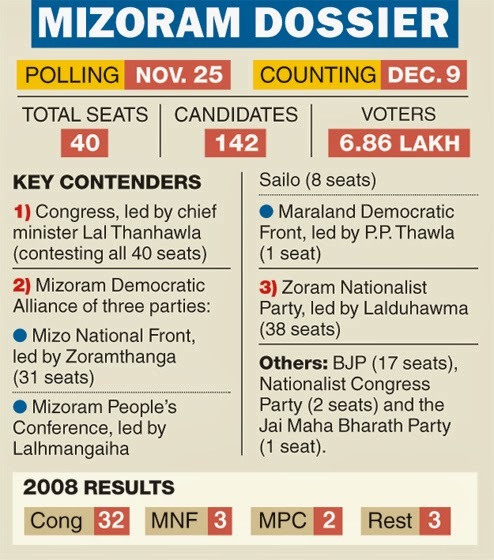 Mizoram Democratic Allaince: Includes Mizo National Front. Aggressively campaigning in all 40 seats, relying not only on the "Mizo nationalism" it has championed since its formation in the early 1960s but also on the Congress's alleged misrule. Zoram Nationalist Party: The most aggressive in the run-up. Its campaign is based not just on promoting its own policies but tearing apart those of both the Congress and MNF. Led by the popular Lalduhoma, it has never been in power.